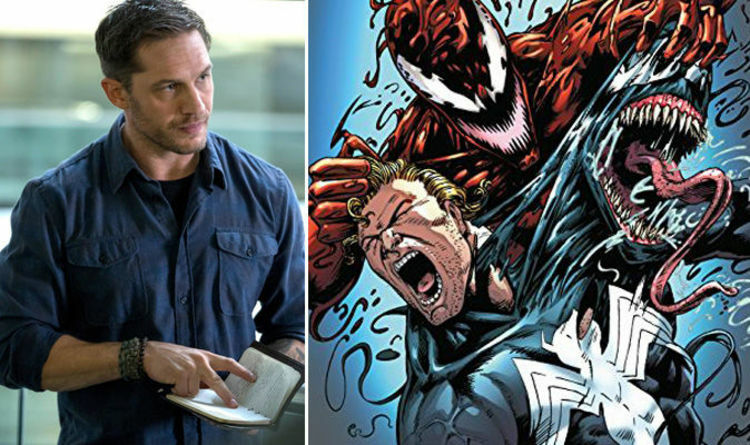 The mid-credits scene of Venom showed Hardy’s Eddie Brock heading to San Quentin prison in San Francisco. There he arrived to interview Cletus Kasady, who is set to become Carnage – Venom’s arch-nemesis, in Venom 2. Now Eddie had his trusty journalist’s notebook with him and it turns out the actual prop from the film was displayed at New York Comic Con over the weekend. Comic Book spotted the notebook and snapped it with all its juicy and disturbing details about Harrelson’s Marvel villain. It reads: “Cletus Kasady. Currently in San Quentin. Killed his grandmother by pushing her down a flight of stairs. “Went on a huge massacre in New York City. 11 murders – Ryker’s [maximum security penitentiary]. “Dug up his mother’s grave after the massacre. Oedipus Complex. The notes continue: “He has an insane mind and a lust for destruction – Homicidal Maniac. “As a child, he grew up in St. Estes Home for Boys after becoming an orphan. “Did Cletus set the fire at St Estes? It killed the disciplinarian administrator…revenge? Eddie added: “Pushed a girl who would not go out with him in front of a bus. She was killed instantly. “Unpatterned bloodshed = the ultimate freedom”. Venom director Ruben Fleisher has teased what’s in store for Venom 2.